Summary: After months of unrest and popular opposition to the government, much of Yemen's territory has fallen out of government control. Several areas are occupied by Islamist militants seeking to implement Sharia Law, while others have fallen under the control of various local groups and military defectors united in their demand for the removal of president and dictator Ali Abdullah Saleh. When a country faces revolutionary change, the power of the people to oppose their government can result in a loss of control by the state, as opposition groups seize territory bit by bit. Despite the country maintaining international recognition as a single "nation-state", the territory claimed by the state may become divided. While in many cases this means one large rebel group taking control of a large section of the country, in other cases the territory may fragment into various scattered regions under the control of multiple groups. This is the process that has been occurring in Yemen during recent months. Yemen is located at the tip of the Arabian Peninsula, south of Saudi Arabia. A republic made up of 20 provinces or "governorates", it is the only country on the Arabian Peninsula with a democratic constitution; yet it also holds the unfortunate distinction of having the lowest standard of living of any country in the Arab world. Like many other allegedly democratic countries, Yemen has remained under the tight control of a single "president", Ali Abdullah Saleh, for more than 30 years. 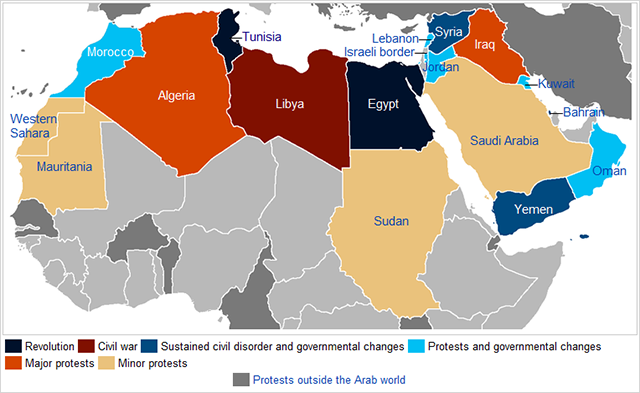 The current unrest began in January of this year, as part of the "Arab Spring" movement that has seen protests across the Arab world and beyond, and which early on resulted in the overthrow of governments in Tunisia and Egypt. After months of protests, crackdowns, and stalled negotiations in Yemen, an armed uprising erupted in late May. Armed opposition to President Saleh's government has been undertaken by two largely separate groups. The first group is a loose coalition of "tribes" (social groups held together by family relations) and military defectors who support the peaceful protesters' goal of ousting the president. The second group is a coalition of Islamist militants calling themselves Ansar al-Sharia ("Supporters of Islamic Law"), whose objective is to create an Islamic state in Yemen. The secular opposition groups are most active in Yemen's populated western region, while Islamist activity is centered along the southern coast and in the sparsely populated regions of the east. located at the lower right. Map is from this Wikipedia page (public domain; original graphic).